We are lucky enough to work with a fantastic group of experienced, patient and talented teachers here at Sewisfaction. All of our teachers are friendly and approachable as well as incredibly passionate about their craft and want to share it with you. Check out our Classes & Workshops page to find full details. 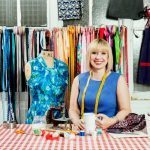 Sheona is the owner of Sewisfaction, a keen dressmaker who loves teaching others about the joy of sewing. 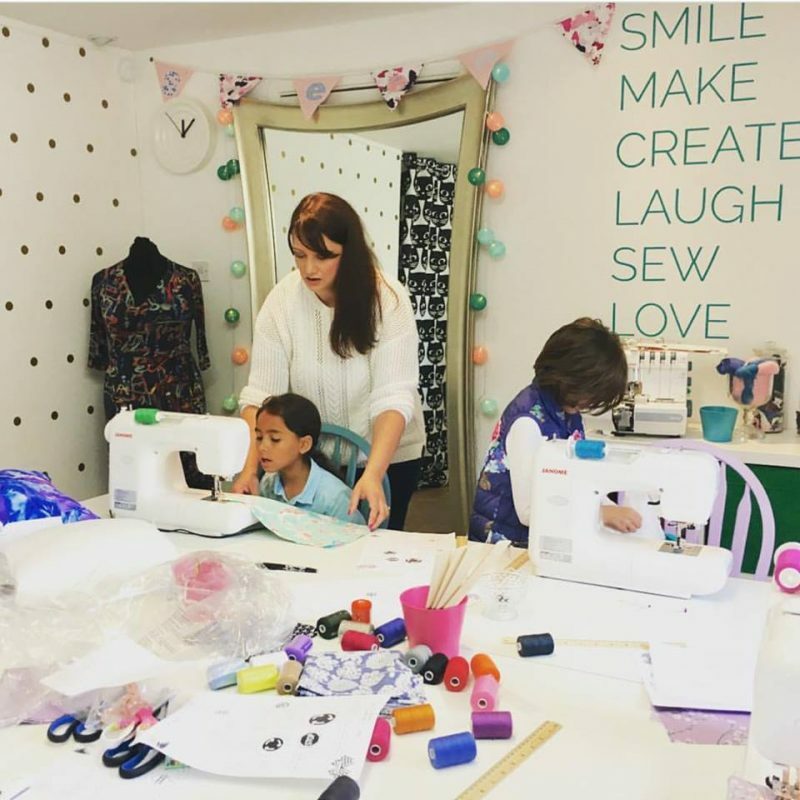 Sheona mixes running the business with teaching some of our most popular classes, and particularly enjoys helping students build their confidence within dressmaking, as well as passing on her skills to the next generation by leading our Children’s & Teen classes. An avid quilter and experienced teacher, Ginny teaches our Quilting classes. A love of fabric, combined with her excellent organisational skills (from her years of teaching!) mean her classes are bursting with information and full of fun. 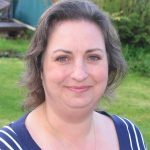 As well as teaching sewing classes, Ginny also own her own small business, Quiltaboo, making keepsakes, quilts and commissions. Gillian has been sewing all her life and teaching for over a decade. She has a degree in Fashion & Textiles and worked in the fashion industry for a number of years. From teaching textiles classes, to A-levels and then Adult Learning, Gillian has helped hundreds of people learn to sew and loves to see people learning and enjoying this fantastic skill. 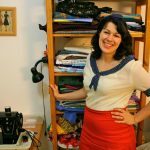 Layla has been teaching for over ten years and running sewing classes at studios across the country, from beginners through to advanced dressmaking courses. She’s a seasoned sewing pro and believes in making things we really want, and loving the things we’ve carefully made. Lucy is an incredibly talented paper and textile artist who has loved sewing, making and creating from a young age. Lucy graduated from Imperial College with a degree in Mechanical Engineering, but never lost her love of textile and paper art. 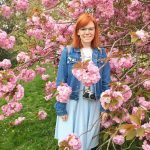 After returning to university, Lucy now spends her time creating work which indulges both her passion for stitching and her new found love of paper, as well as teaching others. Sharing her love of sewing via her popular sewing vlog, I Sew A Lot, Amanda lives up to her vlog name by being an incredibly prolific and talented sewist. 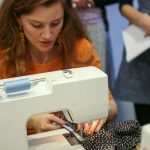 Encouraging others to love sewing by teaching classes in her calm and enthusiastic style, Amanda teaches some of our Newcomer and Improver classes. Zoe loves teaching a wide variety of craft, from macrame to weaving, needlefelting to crochet! Zoe’s colourful and approachable style makes crafting fun for both adults and children. 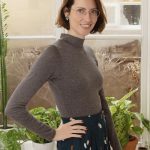 Dressmaker and co-founder of sewing pattern brand By Hand London, Elisalex de Castro Peake trained as a shoemaker and spent five years working in the fashion industry before turning her passion for sewing into a career. 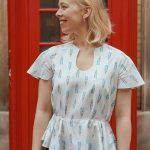 As well as designing sewing patterns and blogging over at ByHandLondon.com, Elisalex has taught sewing classes all over the UK and contributes to various sewing publications. 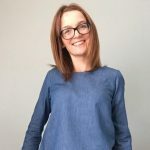 Alex is experienced in all levels of sewing and dressmaking and really enjoys passing on all the knowledge she has gained over the years both formally and self taught. She teaches many of our intermediate and advanced classes with a focus on fitting and pattern adjustments. 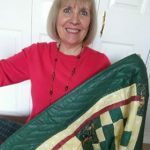 Having loved sewing for over 15 years, Barbara moved from her native Holland and set up her own sewing studio in Scotland. 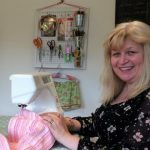 Having relocated to the South East, she now teaches some of our Newcomer and Improver classes and loves spreading the joy of sewing through teaching. Caroline has a wealth of sewing experience, working in the costume industry she has sewn costumes for all major West End musicals, worked for Disney, and teaches sewing privately and at university as well as a range of classes here at Sewisfaction. She is trained in pattern cutting and co-owns her own sewing pattern company, Selkie Patterns. ITV, The RSC, The Royal National Theatre & BBC. 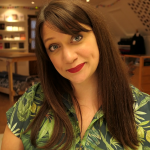 Her diverse professional experience made her the perfect candidate for the role of Sewing Producer for TV’s Great British Sewing Bee Series 1 – 4. She’s also a sewing book author and magazine columnist.